Anyway, here is the old framed poster that was in the garage. (I had painted the frame a few years ago). Then my helper rolled on the paint and I trimmed the edges. Nice and simple and best of all FREE! I feel like our family room is starting to feel more complete! 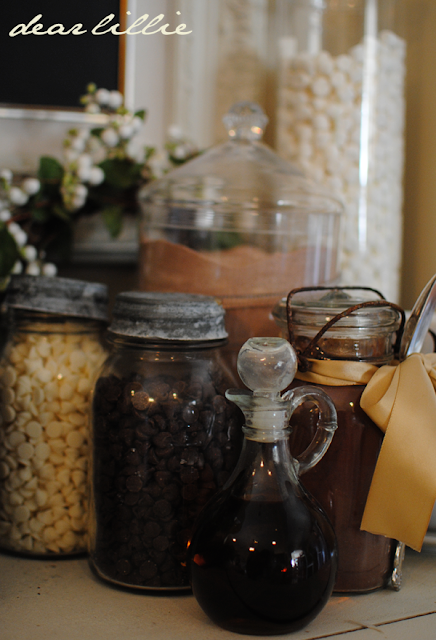 We got e-mails asking what we used for our hot cocoa station when we showed it back in January. There are two types of cocoa, marshmallows, white chocolate chips, semi-sweet chocolate chips, and vanilla. The Bunny Silhouette Pillow Cover in our family room is now for sale in our shop! My sister, Jamie sketched out this adorable bunny for us! I love how it turned out. Perfect for Easter and spring! I also think it would be adorable in a nursery. 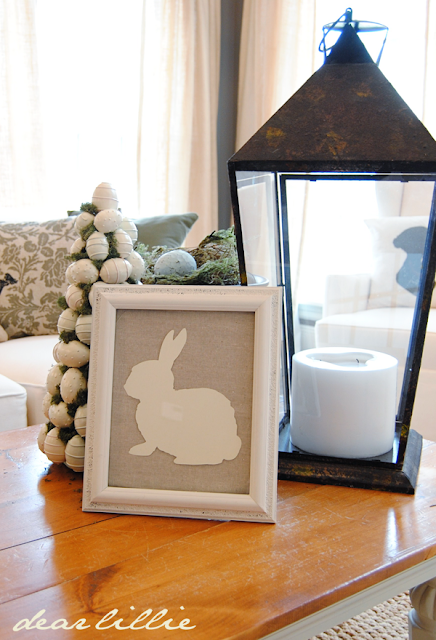 The Bunny Silhouette is also available as a paper cutout! 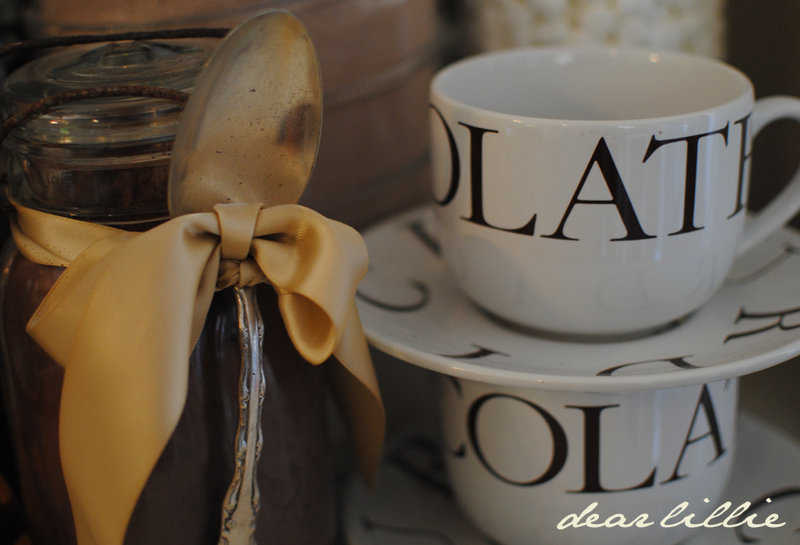 It's available in two different sizes and along with cream, is also available in a variety of pastel colors! I hope you all have a blessed Thursday! 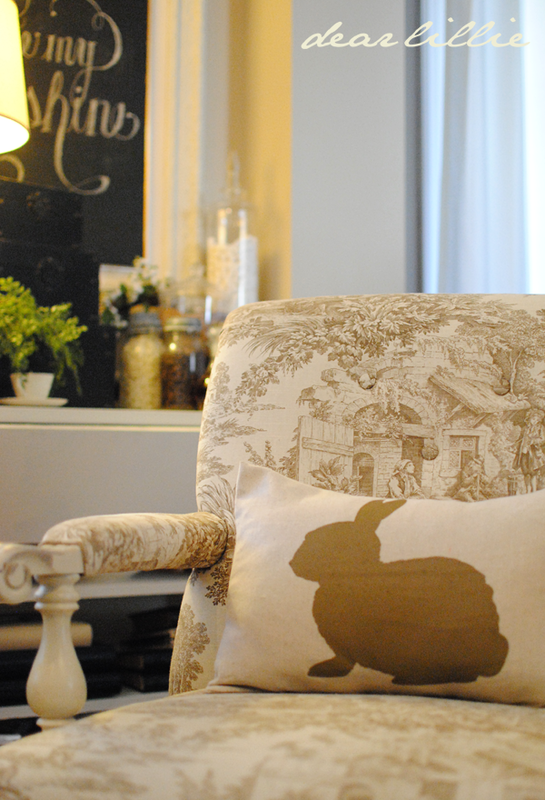 Could you do a post about that gorgeous chair in your family room the bunny pillow is displayed on? Maybe you have in the past and I might have missed it but it is awesome! 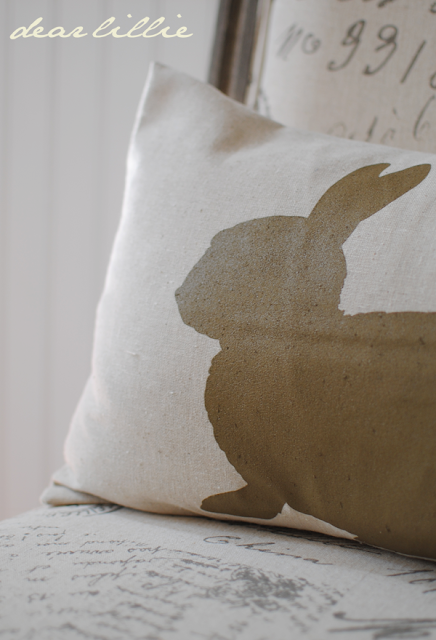 Cannot wait to get my bunny pillow cover! Thank you! I will check and see if I can find the "before" shot of that chair. It was a orange velvet with cigarette holes in it. I think we paid around $20 for it at an antique mall in Indiana. I don't have the original pictures on this computer but I might have them saved on a disc. If I can find them I will do a post on the transformation of that chair. Love your living room. So welcoming. Love the bunny pillow as well. How do you keep breakables within your little ones reach. Well trained little girls????? Looks beautiful!! Your handwriting has to be the best I've ever seen! What a beautiful frame Jeni...I wish my garage had hidden treasures like that...thank you for always inspiring.. When do you think you'll have the large cream silhouettes back in stock. Love all the bunnies. And I really admire your chalkboard abilities. 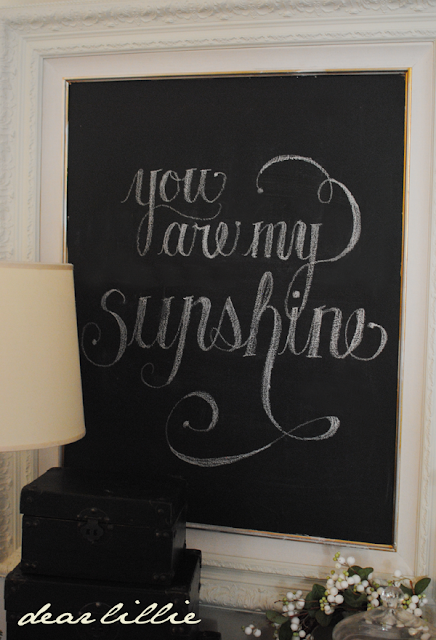 Have you ever checked out Dana Tanamachi she is an amazing chalkboard artist? Thanks for always posting such inspiring posts...you always make me want to clean up my house, your's is always so picked up and clean! We have more in stock now! Oh my goodness! I just checked out Dana's site. She is extraordinary! Seriously - absolutely AMAZING! Not only is her chalk writing flawless so is her graphic design. I love it Jennifer! 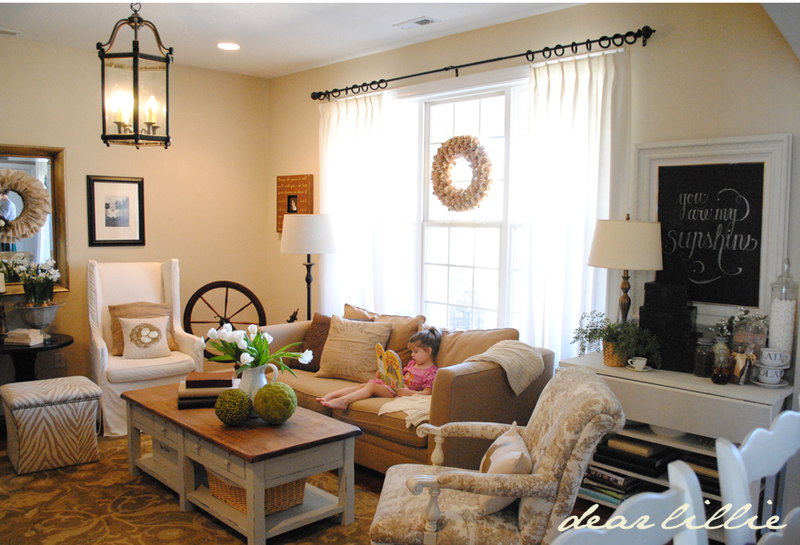 That whole vignette looks beautiful, as does your family room! 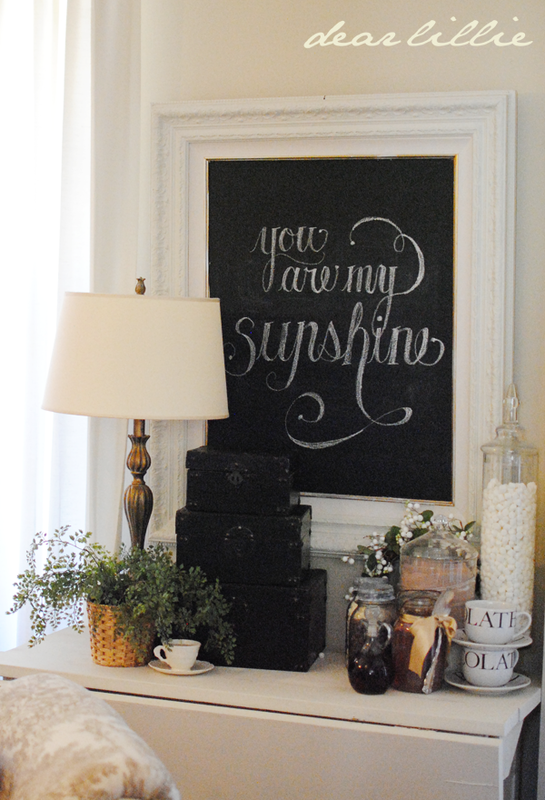 YOU are our sunshine! Thank you for inspiring me. Now if I could only have penmanship like you... a girl can dream ;) Heading to the shop now. Thank you and your team for all your hard work! Happy Day! Hugs. 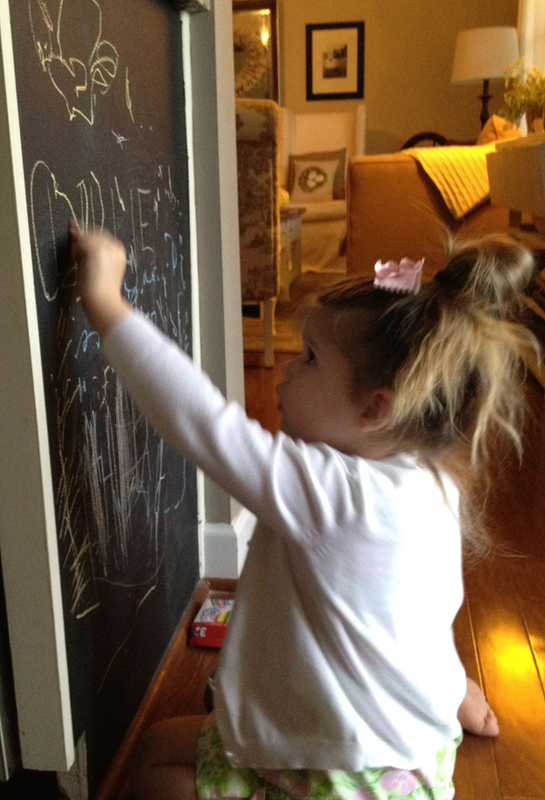 I love the chalk board! 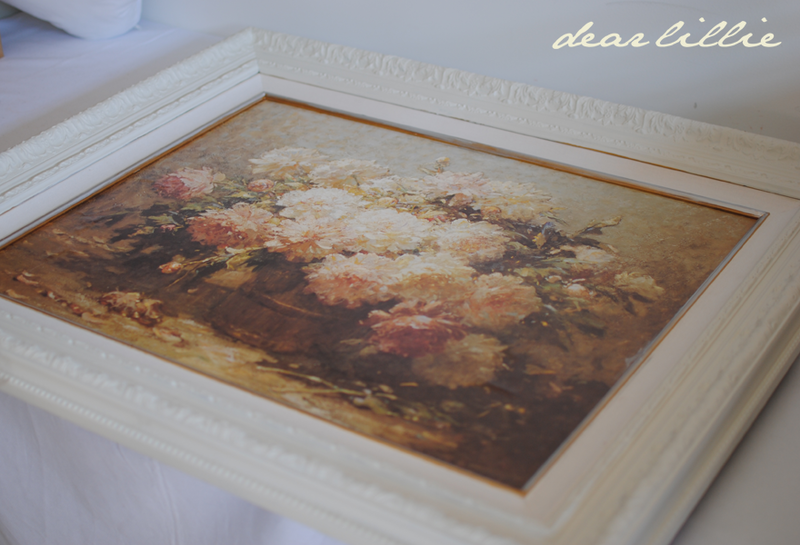 The frame is so pretty and it is the perfect size for that space! I have to admit, I loved the poster that became the chalkboard! 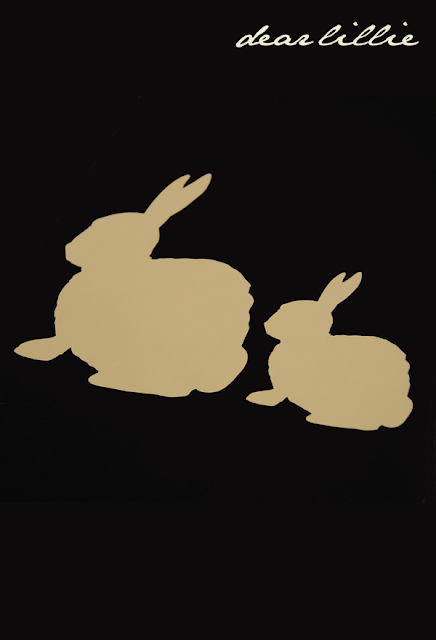 lol I just ordered some of the bunny silhouettes! They are so cute! Love this! I have an old one waiting for a project like this. I love it in the kitchen at kid level! All so cute!!! You have GREAT penmanship! So BEAUTIFUL! I've done a couple of chalkboard projects, love them. I just wish I could write like that not to mention your eye with a camera! Love this!!! You handwriting is BEAUTIFUL!!! What a great idea!! !Thanks for sharing. Great chalkboard, love the frame. 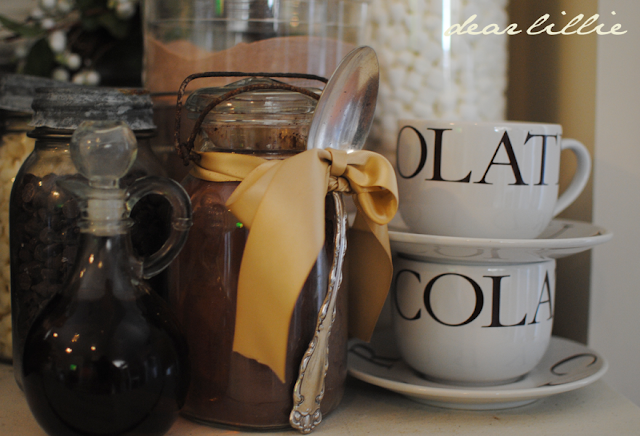 And I adore your hot chocolate station! I love the way you write on your chalkboards... It's too cute. 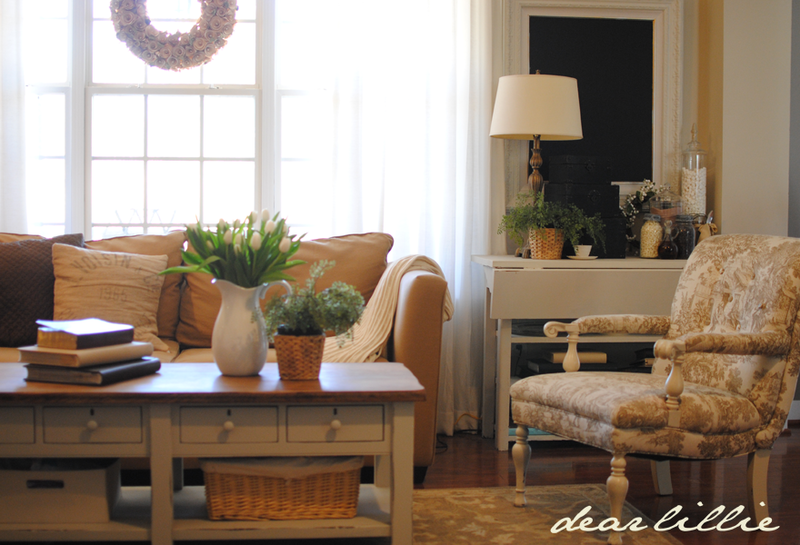 The chalkboard frame is beautiful(and what an unexpected find) and your penmanship is outstanding..I too love the bunny pillow..I think your home is beautiful and so warm and inviting..Have a great week..
Room is beautiful - your chalkboard looks so pretty with your writing! 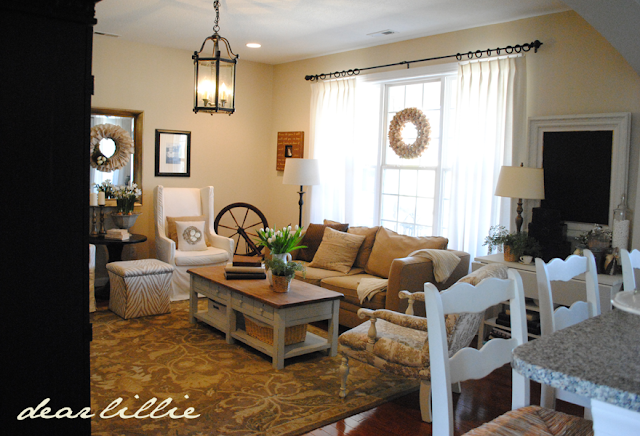 Lillie is adorable - think of all the great things you are teaching her. 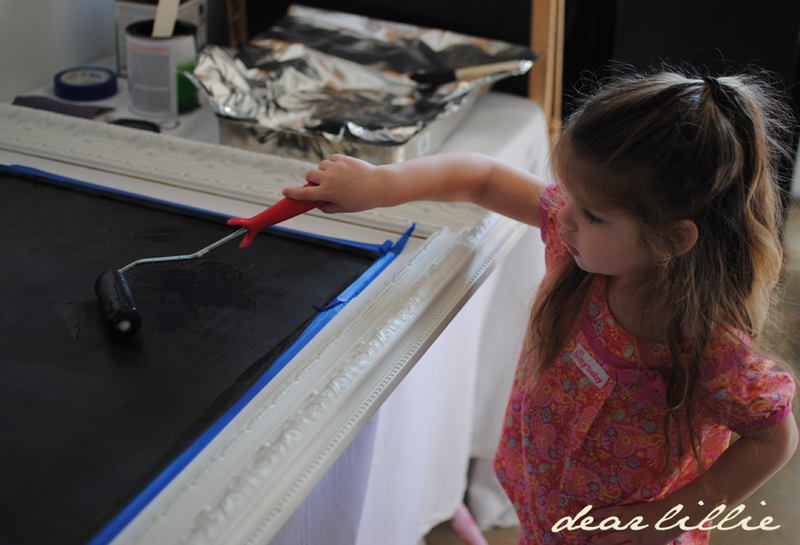 She looks so adorable painting - concentrating so hard! The bunny pillow is so sweet. Adorable post as always! I love your handwriting! 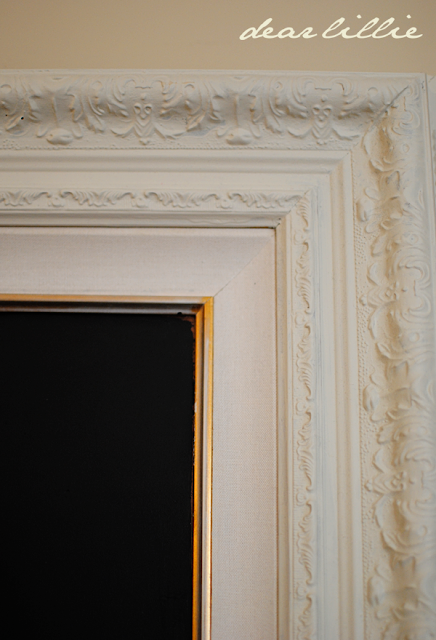 My chalkboard frame turned out just okay. The chalk doesn't write that well on it actually. Wonder if 3 coats isn't enough. 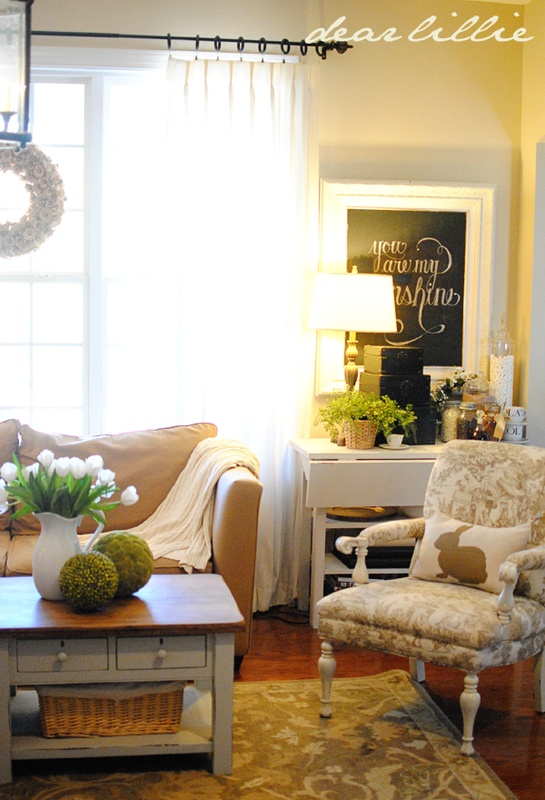 The framed chalkboard in the living room is a beautiful idea; a nice change from having a chalkboard in the kitchen. You have such a beautiful touch for decorating, and your ideas are so unique. I enjoyed seeing you on The Nate show the other day ~ I was half watching when I began to see a familiar face and familar house ~ you did a wonderful job! 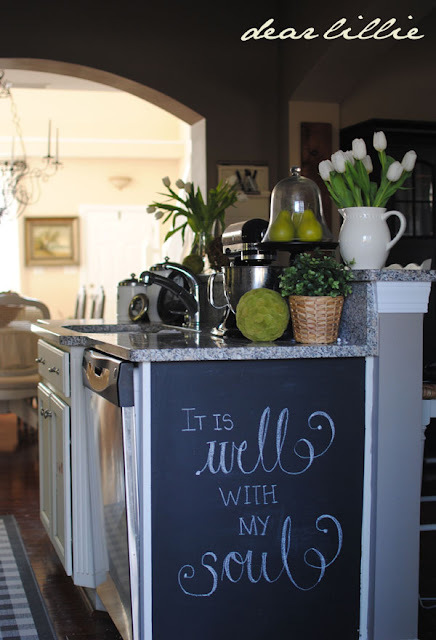 Jennifer, I love your chalkboards! 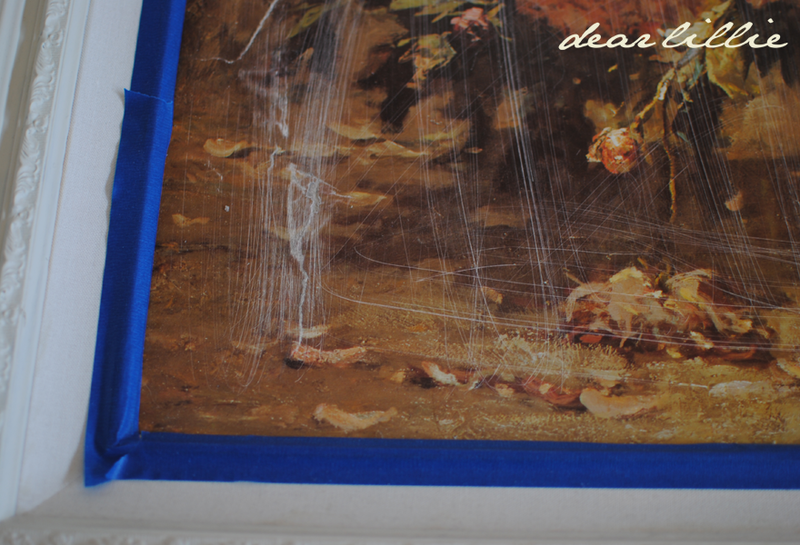 Do you freehand the writing? Thanks, Lynn. Yes, I do. 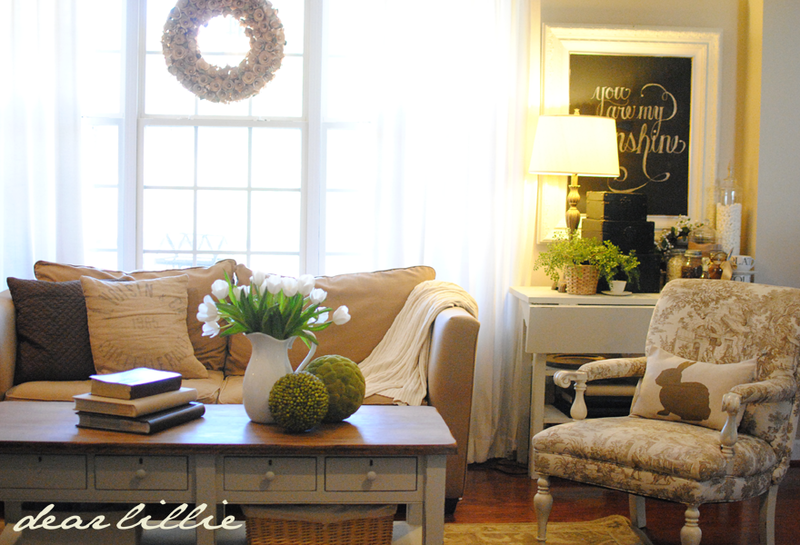 Love your living room, actually all of your rooms, I'm actually making that wreath you have hanging in front of the big windows, the one like roses, It is taking a long time to make, but it looks beautiful in your house. You are great at designing. Hi Margie - Believe it or not she just uses standard white children's chalk. 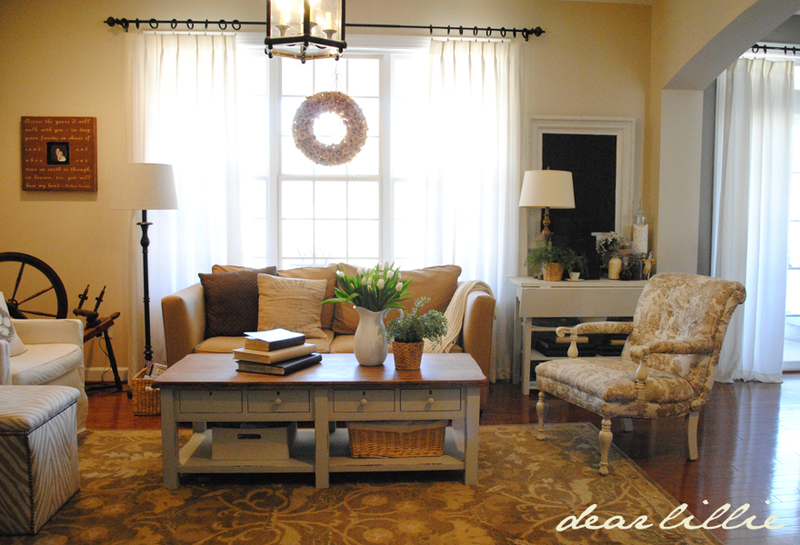 Can you please tell me a little more about your curtains in your kitchen and family room. I believe we have a similar style window with the smaller windows above the main windows. I see you list Penny's, but there are several pinch- pleat panels. I believe these are white, but I am not positive. I would most appreciate the information. Thank you! Honestly, I got them for our last house years ago so I can't remember the name or exact color of them. I think the word "supreme" was in the name but that's all I really remember (it was long before I knew about blogging so I didn't think to keep track of that type of info). They are not a true white. More of a soft white or a very light ivory. Hope that helps a little. Hi! I purchased some downloads and remembered a few years back you posted a tutorial for your "coffee stained" chalkboard frame that you used to insert the chalkboard prints into. the frame was large enough to insert the 24x36 print. Can you tell me if this tutorial is still available on your blog?